Featured in the first season of Survivor nearly a decade ago, Sabah—the easternmost state in Malaysia—is becoming a hot spot for tropical sun and fun. Home to the highest mountain in Malaysia, a population of huge-schnoz monkeys and plenty of exotic fruit cocktails, Sabah is simply sublime. Nature lovers: At an imposing 13,000 feet, Mount Kinabalu is an omnipresent stunner, shrouded in billowing clouds like garlands on a Christmas tree. Thrillseekers: At Kinabala National Park, you can find Asia’s first via ferrata (protected climbing route), which also happens to be the world’s highest. Partake in a six-hour course in the park which involves zip-lining, balance beams, suspension bridges and copious amounts of rock-climbing. Not for a beginner, the trek begins at 11,000 feet, ascending 1,500 feet to the summit. Foodies: Also in the Kinabalu National Park, stop at Sabah Tea Garden for a tea-plantation tour and tasting. The Tongkat Ali tea, made from the herb known as Malaysian viagra, makes for a cheeky souvenir. Quirk Factor: One of the most unusual spa treatments ever — for a small fee, you can have the dead skin removed from your feet via fish feeding at Tagal Fish Spa (photo above). Step out in the shallow stream, and within a few minutes, dozens of gnarly-looking carp will surround your ankles, furiously nibbling away. Proboscis Safari: The proboscis monkey was not blessed with great looks, with its long, bulbous nose and pot belly. Only found in Borneo, these monkeys are rare finds in the wild. Amazing Borneo offers sunset boat safaris in the Labuk Proboscis Monkey Sanctuary. Bring binoculars, as most perch high in trees. Baby Bonding: Shangri-La’s Rasa Ria Resort a chic place to stay with delicious restaurants and plenty of things to do like paddle-boarding on the China Sea or nightly tribal dance lessons. It’s also home to an orangutan sanctuary, where you can watch adorable baby orangutans fly through the air during the daily feedings at 10 am. Gaya Street Sunday Market: The weekly Kota Kinabalu market is an exotic-fruit extravaganza. Try snake fruit (with skin that looks and feels like a snake’s), mangosteen, rambutan (like lychee fruit), tarap (uniquely Bornean) and durian. 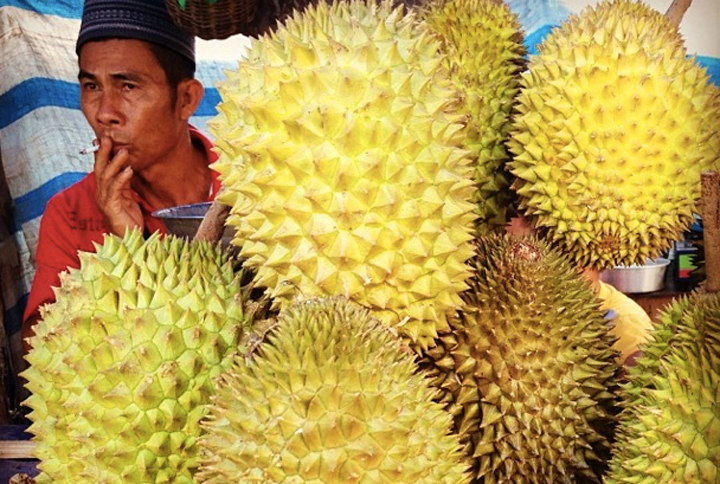 Durian (pictured above) is an unforgettable experience. It smells like rotting garbage but tastes like heaven. Malaysia Airlines flies four times weekly between LAX and Kota Kinabalu International Airport (KKIA) via Narita, and has daily service between Kuala Lumpur and KKIA. The airlines also has codeshare flights operated by American Airlines daily from Dallas, Chicago, Miami, New York and Raleigh-Durham, N.C. Shangri-La Rasa Ria Resort is a 45-minute drive from the KKIA airport, and they do offer transport. For our review of Shangri-La Rasa Ria Resort in Kota Kinabulu, keep reading HERE. Headline photo by Lindsay Taub, the rest by Lanee Lee.